The MEA 2100 System is the most versatile in vitro recording system from Multi Channel Systems. You can record from neuronal or cardiac cultures, stem cells, or brain or cardiac slices. Today, the MEA 2100 System is a very compact solution with integrated amplifier and stimulus generator, temperature control, and the option for real-time signal detection and feedback. The main advantage of the MEA 2100 System is its flexibility. Various headstage types facilitate the usage of different MEAs. 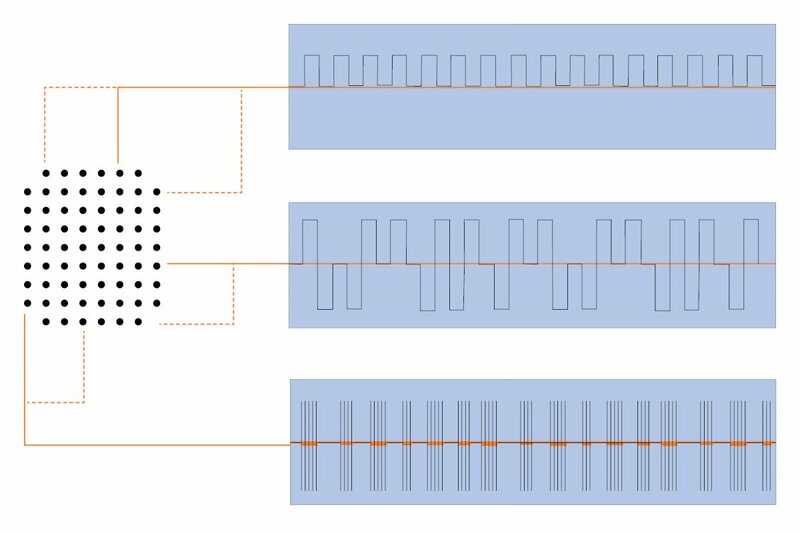 You can record from up to 4 MEAs in parallel, all at a sampling rate of 50 kHz per channel, ensuring an excellent data quality. The MEA 2100 System consists of several components: MEAs, headstage, interface board, PC with software, temperature controller, as well as an optional perfusion cannula and peristaltic perfusion pump. The system is very flexible, regarding electrode count (32, 60 or 120) and number of MEAs that can be recorded from (1-4). By exchanging single hardware components, it is easy to change the set-up anytime. Please click on the arrows on the right to learn more about the single components. The planar electrodes with a dimension of typically 10-30 µm are arranged in a square recording field where the spacing between these electrodes is in a range of 30-700 µm. 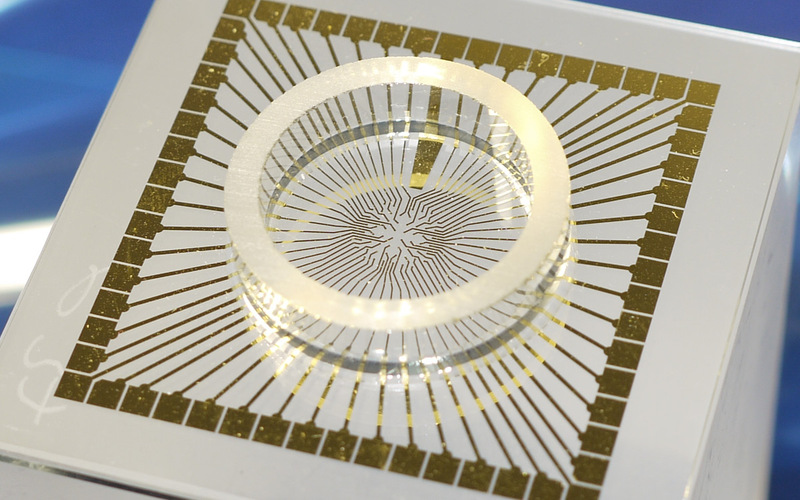 The electrodes are embedded in glass substrate with a size of 5×5 cm. Multi Channel Systems offers the widest variety of MEA layouts. Depending on your headstage, you can use MEAs with 32, 60 or 120 electrodes. You find the complete range of MEAs here. The MEA2100-System comes with 5 MEAs that fit most applications (opaque tracks (Ti), electrode diameter 30 µm, interelectrode distance 200 µm, with internal reference electrode and glass ring). If you prefer to use another MEA, please let us know when ordering. The complete range of MEAs is available. MEA 2100 headstages are available in different variants. You can either place one 32-electrode MEA, one 60-electrode MEA, one 120-electrode MEA, two 32-electrode MEA or two 60-electrode MEAs in the headstage. The contact unit of the MEA-headstage can be changed according to your experimental needs. The rest of the setup is not affected, so changing the contact unit is simple, quick, and cost-effective. The headstage also provides an integrated stimulator, which can generate current or voltage stimulation signals on 3 independent channels per MEA slot. You can select the stimulation electrodes and design the signal shape via the included software. The integrated stimulus generator offers 3 different stimulation patterns (monophasic, biphasic, bursts) per available MEA. You can choose between current and voltage stimulation and select each electrode for stimulation. All configurations (stimulation patterns, output, and electrodes) are defined via the included MC_Rack data acquisition software, so you can control all parameters of your experiment from within a single program. Your MEA 2100 System can also consist of two headstages. You can then run two or four independent experiments at the same time. The data acquisition software opens one instance per MEA, so you can select all settings individually for each MEA. In the MEA 2100 headstage, there is a heating element right beneath the MEA. It is controlled by the included temperature controller, so the temperature of your sample is observed and kept stable at all times. You can select the desired temperature at the device itself or using the included control software TCX-control. Multi Channel Systems also offer the MEA 2100 System with enhanced perfusion, meaning that the system comes with a heatable perfusion cannula, another temperature controller, and a peristaltic perfusion pump. When ordering a MEA 2100 System with enhanced perfusion, you will receive one perfusion cannula and one peristaltic pump per available MEA slot. The interface board receives data from the headstage via a High Speed eSATA cable. In the interface board, you find a freely programmable digital signal processor, which can be used for real-time signal detection and feedback. Moreover, you find various analog and digital in- and outputs for synchronization with other instruments. The interface board connects to the computer via USB. Real-time signal detection/feedback is integrated in all MEA 2100-60 and -120-Systems. It is an essential feature if you need fast and predictable reactions related to recorded analog signals without time delay. Normally, the signal must be analyzed by the computer, which leads to an unpredictable time delay of the stimulus of at least 100 ms. By moving the analysis from the PC to the DSP (Digital Signal Processor) integrated in the interface board of the MEA 2100 System, the detour is obsolete and the time delay reduced well below 1 ms. Simply define the condition for the feedback and download it to the interface board (1). 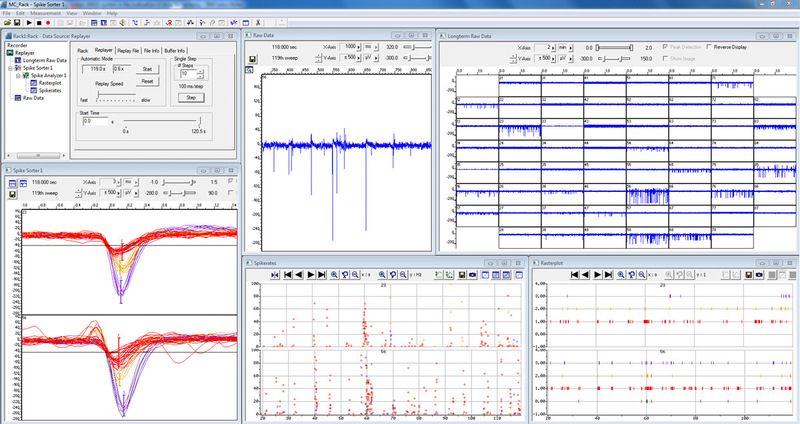 During recording (2), the DSP filters the data and detects spikes (3), checking whether your condition is fulfilled. When a designated event is detected, the integrated stimulus generator generates the stimulus pulse (4). Please note that you need a third-party software for programming the DSP. Within the same software, you can design the stimulation patterns and decide when you want to stimulate. 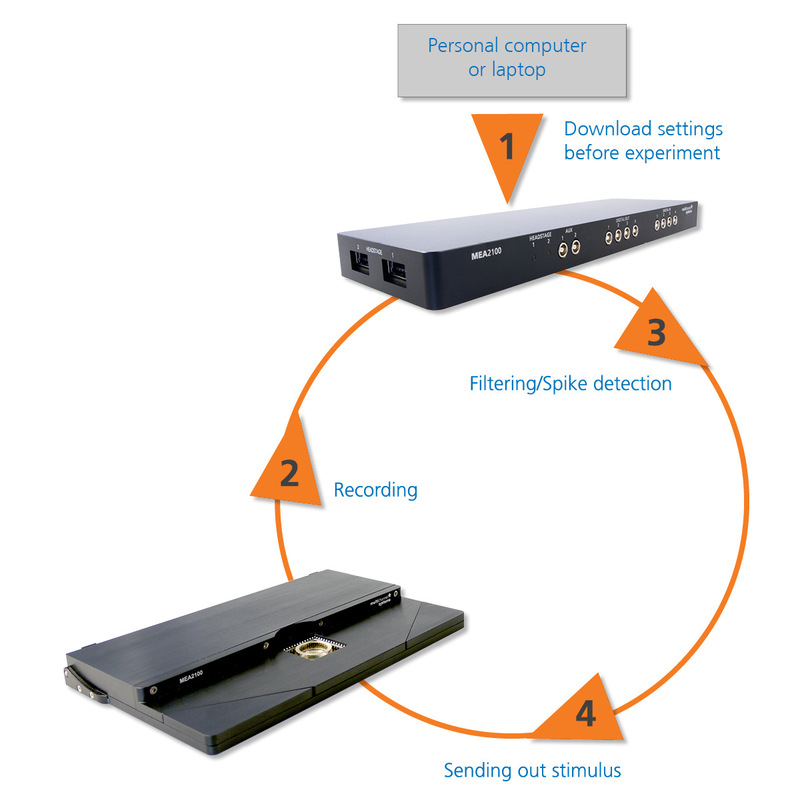 For standardized experiments, Multi Channel Systems offers two software packages available for purchase:Cardio2D for analysis of cardiac cells, tissues, and whole organs and the LTP-Director for standardized LTP experiments in hippocampal slices. As a policy at Multi Channel Systems, updates of all software packages are available online and free of charge, so you are always up-to-date with recent developments.